"Shoe Repairs, Key Cutting & Shoe Care Supplies"
Couldn't ask for more, did a great job on my boots and cut me 2 keys all for a good price. 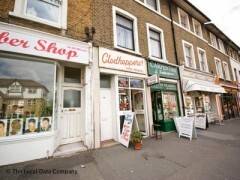 Nice chatty owner and convenient location right by the station. Great service at an even better price. Clodhoppers repaired my boots for £18.50 whereas 2 other places in the City quoted me £29. Excellent materials and fine work, even polished my boots up for free. Sent it in at 9am on a Saturday and was ready before lunch. Satisfied customer who will be going back. Been using Clodhoppers for years now for key cutting and shoe reparis. Really great work on my husbands leather soles he wont let me go anywhere else! Good prices and Mark the owner is very friendly which is an added bonus.